StoCretec has launched three innovative new products into the UK market. 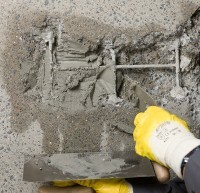 StoCrete SM, StoCrete SM P and StoCrete RM F offer quick and reliable solutions which save time and money for a wide range of concrete repairs. StoCrete SM is a 3-in-1 repair mortar which is simply applied, sponged down and is then typically ready to receive a top coat in just 4 hours. StoCrete SM P adds the benefit of corrosion protection, which saves even more time by eliminating the need for this to be carried out as a separate operation. Both products are rated Class R2 to EN 1504-3, and are available in 25kg sacks, or handy 10kg pails. Typically, once a sack has been opened the entire contents have to be used or discarded. The pail option greatly reduces wastage when performing occasional repairs, as small amounts of material can be used and the pail resealed. StoCrete RM F offers a similarly impressive performance for flooring repairs when there is a need to repair small defects, produce fillets, falls, or level uneven areas quickly and easily. It provides superb workability, and is the ideal choice for smaller flooring jobs which require a quick fix with a reliable, professional finish. Rated as a class R3 to EN1504-3, StoCrete RM F is trafficable, impermeable to water and resistant to salt and frost. StoCrete RM F is also supplied in resealable pails, making it a convenient and economical option. The three new products form part of the wider StoCretec range of concrete solutions which have recently been introduced to the UK for the first time. StoCretec has over 40 years’ experience in this field, and the full range of systems provide solutions for any type of project, from small concrete patch repairs, through to large-scale, sprayed mortar projects and high-performance industrial floor-coating systems.